March Contracts Lag: Cause for Concern? 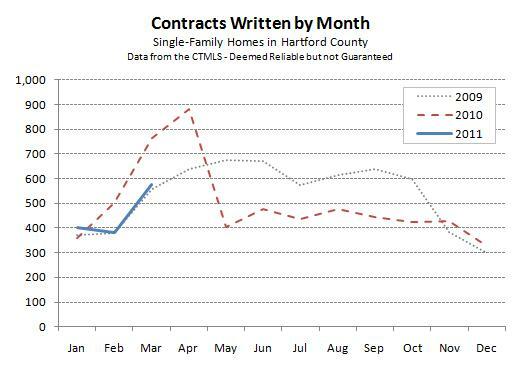 Negotiated contracts on single-family homes in March 2011 were down about 24% from the year-previous monthly tally. Wait a minute … that sounds awfully familiar. For the second month in a row the market was only three-quarters as active as last year. Does this establish a trend? Is it cause for concern? Although we may be seeing the beginning of a trend, we don’t think it’s cause for concern. In fact, this looks like a normal year! Last year was different, special really; buyers were out early. This year we got off to a more typical slow start. The following chart shows that we’re tracking 2009 very closely, and actually seeing more traditional real estate seasonality. The next couple of data points will be very interesting. Will we continue to follow 2009? Will the peak of the spring market even come close to the tax-credit-driven 2010 peak in April? Below is the data for the individual towns. We don’t think that the comparisons to last year are very meaningful, so we’ll skip the usual commentary about the individual towns. However, we will print the chart so that there is a continuous record of the data, and just in case it’s needed as a reference if others report on year-over-year results for the month. Just so you’re prepared … the real estate markets will look fantastically vibrant and active compared to last year once we get into May for contracts written, and July for deals closed. Since this year will not include government incentives for home purchase – what do you think will drive the vibrancy in May and June? – generally improving trends in the economy along with still rather low interest rates? As to values – flat or slightly lower or higher? Any instinct on that? Number of transactions tend to drive industry incomes – but overall values will be of note to the larger regional economy. Suppose that May 2011 has exactly the same number of contracts written as 2009, which was 677 (top chart). Compared to the 404 written in 2010, this would be a huge 67% improvement. It’s the stuff of dramatic headlines. Ahh – i see the hypothesis now. We’ll see how it unfolds — but that does seem like a reasonable prediction. I live in West Hartford. The figure for this town looks grim, but very few houses were on the market in until April. Only now are “For Sale” signs popping up everywhere. I would expect that to skew the data. What do you see? Thank for the question, Elle. 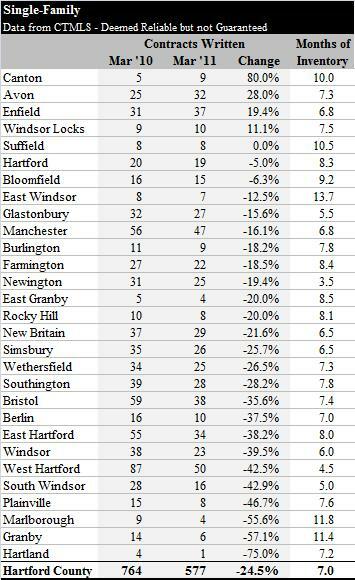 I agree with your observation that the later start to the spring is why the West Hartford number is so bad. Although the number of sales has lagged, the market is still moving well. Inventory is low, and we’ve seen many homes sell within days of hitting the market, at a variety of price points, and in neighborhoods throughout town. I did an open house in the Center yesterday and had very strong turnout, with most of the visitors legitimate buyers trying to find a home. (Versus neighbors curious about the house for sale down the street) There is demand out there, so I expect deals to keep coming together. Buyers looking for popular types of properties need to be watching the market closely. And sellers will really benefit from taking the time to get their home ready for sale and then listing it at a fair price.